Eartha's Official Website - EARTHA, double Grammy nominee and winner, is an eclectic alternative rock artist, musician, singer and songwriter, who is heralded for the re-invention of her award-winning sound, and musical style that is a hybrid of many and evades categorization. Mapping the course of Eartha's career may read like a fairy tale, but learn about the inspirations, hopes and hurdles that steered her. Eartha is a musical pendulum that swings from genre to genre with great authenticity and simplicity. Simply put, Eartha is simply different! That was not only the official Eartha debut slogan, it's a fact. Always on overdrive, Eartha Rocks! 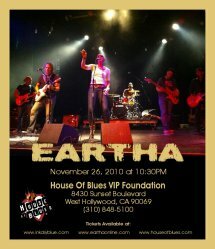 Get Eartha's latest news, music, blogs, photos, videos, digital downloads, interviews, and tour information.